University College serves both undecided students (students exploring the University’s major options before selecting a major), undeclared students (students working towards admission to a selective major) and students who are seeking to earn the Bachelor of Specialized Studies, the Bachelor of Criminal Justice, or an associate’s degree. University College advances the mission of Ohio University by providing institutional leadership across colleges in order to promote academic advising, teaching, and learning. The college provides a number of University wide services and is home to key units such as the Academic Achievement Center, the Allen Student Advising Center, Learning Community Programs, and Student Accessibility Services that help all undergraduates attain academic success. 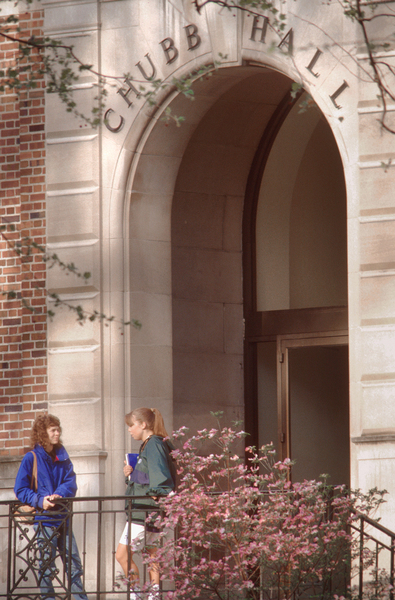 University College staff members manage advising programs and orientation programs such as Bobcat Student Orientation that assist students in reviewing their interests, planning academic programs, and adjusting to University life. In addition, the College oversees the University’s General Education program and fosters student success through such initiatives as learning communities, Army and Air Force ROTC, study skills, tutoring programs, and workshops to promote academic success. Any Ohio University student who has fewer than 60 credit hours may be admitted to University College as an undecided student. A separate application is required to enter the Associate in Individualized Studies program, the Bachelor of Criminal Justice program, or the Bachelor of Specialized Studies program. Academic Advising is a high priority of University College. Our professional and adjunct advisors strive to help you launch your career at Ohio University, to help you explore academic and career options, and to assist you with decisions about how you can best use the University to promote your learning and development. University College students will be exposed to various advising structures based on your admission status and goals. First Year UC students will traditionally be assigned to an advisor linked to the UC 1000 Mastering the University Experience Course. Students who declare a pre-major or major in Bachelor of Criminal Justice (BCJ), Bachelor of Specialized Studies (BSS) or an Associate Degree will be assigned to an advisor located in the Advising and Student Services Office or designated campus advisor. Students interested in the AIS or BSS program(s) will work closely with a University College advisor and faculty to design, gain approval for, implement, and earn their unique degree. Students from any other undergraduate college are welcome to meet with an advisor in the Allen Student Advising Center if they are considering changing majors, have questions that touch on University wide issues or involve University College programs. College Credit Plus students are advised by University College advisors in the Allen Center. If you are in University College and have a particular degree program in mind, whether that program is selective or not, you should refer to the degree requirements outlined elsewhere in this catalog. If you are interested in determining your progress toward one or more majors, you may create a “what if” DARS report for the major you are considering. Simply go to www.ohio.edu/registrar/darsonline.cfm and log in using your OHIO ID and password. If you want assistance creating or interpreting a “what if” DARS, please contact the University College Office. One of our advisors will be glad to assist you. Although your professional or adjunct advisor will help you prepare a schedule each semester, you are ultimately responsible for your education. Advising is a collaborative process for which you need to be prepared. It is imperative that you arrive on time and prepared for advising appointments and that you know and follow requirements and procedures at the department, school, college, and University levels. Undecided/undeclared students in University College who enroll at Ohio University as first-year students must declare a major by the time they earn 45 hours. External transfer students may complete two semesters of full-time enrollment before they must declare a major, regardless of their total hours earned. At 45 hours (or the third semester of enrollment for transfer students), a hold will be placed on a student’s registration until he or she meets with a University College advisor and develops a realistic plan for declaring a major. University College offers “Choosing a Major” activities to explain the step-by-step process of making an informed decision about major selection. We want to do our part to ensure that you are on track for a timely graduation. Academic Achievement Center (230 Alden Library, 740.593.2644) helps students maximize their academic potential by providing a variety of support services, including TRiO Student Support Services, academic skills courses, college study skills coaching, writing assistances, one-on-one peer tutoring and group tutoring. For more information, follow the hyperlink or contact us via email at aac@ohio.edu. Advising and Student Services (140 Chubb Hall, 740.593.1935) assists students with major exploration, degree declaration, and progress towards degree programs housed in University College. For more information, follow the hyperlink or contact us via e-mail university.college@ohio.edu. Allen Student Advising Center (417 Baker University Center, 740.566.8888) helps students from across the university ensure their choice of major is a good fit. The office also provides intervention programs for students regardless of their major. For more information, follow the hyperlink or contact us via e-mail advisingcenter@ohio.edu. Learning communities (140 Chubb Hall, 740.593.1936) allow first-year students the opportunity to have the benefits of a small college atmosphere while experiencing Ohio University’s large campus culture. Participation in a learning community guarantees students 2–4 common courses for fall semester. Each community has approximately 25 students. As a result of this small size, participating students develop cohesive relationships with their peers and have enriched interaction with faculty. Participation in a learning community gives the opportunity to engage in academic as well as social activities with members of the community. It is the mission of Student Accessibility Services to ensure equal opportunity and access for students with disabilities in the Ohio University community. Central to this mission is the development of an academic environment that is accessible to all people without the need for adaptation. While working toward the goal of full inclusion, accommodations must still be provided on an individual basis. The type of documentation required depends on the individual disability. Guidelines for documentation are available on our website or inquiries may also be made in person or by phone. At the conclusion of each academic term, all students who, at the time of review, if you do not have an accumulative GPA of at least 2.0, will be placed on academic probation. Removal from Probation. Removal of probationary status is automatic at the close of the semester when your accumulative GPA rises to 2.0 or above, unless your college requires higher standards. Dismissal (Drop) and Reinstatement. If you have been dropped, you are not able to enroll for courses at Ohio University. You may petition your college student services office for reinstatement, but normally reinstatement will not be granted until at least 12 months after your dismissal. As a condition for reinstatement, the dean of your college may suggest remedial steps you can take. Petitions received after the deadlines above will be held for review for the next semester. If you have been dismissed from the University for a second time, reinstatement is possible only under extraordinary circumstances and usually is not granted until at least 24 months after the second dismissal. Each summer, University College conducts Bobcat Student Orientation, which is designed to acquaint new Athens campus students and their families and guests with the programs of the University. New students will meet with faculty, staff, and orientation leaders to get to know Ohio University, plan an academic program, complete a class schedule, and register for their first semester. Students will also learn about the wide variety of social and group activities available on campus, while becoming acquainted with other students in their college. Bobcat Student Orientation is mandatory for all new Ohio University students. Orientation programs are also held before the fall, spring, and summer semesters for first-year and transfer students. Please contact Bobcat Student Orientation at 740.593.1951 with any questions. All new University College first-year students and transfer students with 20 or fewer credit hours must enroll in a learning community for their first semester on the Athens campus. Learning communities offer a unique opportunity to work closely with a small group of fellow bobcats who are also launching their careers at Ohio University. The College Achievement Program (CAP) has been helping first-generation students, low-income students, and students with documented disabilities attain success at Ohio University. CAP operates under a U.S. Department of Education TRIO Student Support Services grant and serves approximately 275 students annually. ROTC is based on our Constitution to help “provide for the common defense.” Today, when the security interests of this nation are so inextricably involved with world issues, our nation needs talented and well-trained officers in its military services. If you have the desire and talent to serve your country, ROTC can lead to a rewarding career as a military officer. Our military needs the best managers, administrators, engineers, and scientists the nation’s schools can produce, to be leaders with wide ranges of knowledge and skill. The Reserve Officers’ Training Corps, in agreement with universities and colleges across the nation, is designed to produce these types of leaders for our nation. The Army ROTC program at Ohio University is under the Military Science Department (MSC); the Air Force ROTC program is under the Aerospace Studies Department (AST). The University offers two-, three-, and four-year ROTC programs. ROTC is divided into two phases—the general course and the advanced course. Any student can take any of the general classes for elective credit to learn more about our nation’s military with no military service commitment. Notice: The ROTC programs at Ohio University might not fully comply with University nondiscrimination policies, because of the selective process of military service. However, the ROTC programs are in compliance with national nondiscrimination policies and the guidance and policies of the respective military services and the Department of Defense. Full scholarships are available on a competitive basis for qualified students. These scholarships pay costs of tuition, mandatory student fees, and a book fee. Additionally, recipients receive a tax-free stipend of up to $400 monthly for the period the scholarship is in effect. Non-scholarship students in the advanced course also receive the tax-free stipend, regardless of scholarship status. Ohio National Guard 100 percent tuition assistance is also available. Field leadership training normally occurs during the summer after the sophomore year (Air Force) or junior year (Army). However, exceptions are possible. All travel expenses, board, living quarters, and uniforms are furnished, and you are paid while attending summer field training. Training equipment and uniforms are lent to all ROTC students without cost. ROTC is a competitive program. If you successfully complete the ROTC advanced program and the requirements for a baccalaureate degree, you will be qualified for a commission as a second lieutenant in the United States Army or the United States Air Force. Upon completing their degrees and the ROTC program, Air Force ROTC students will begin their professional careers in one of more than 40 specialized career fields, including operations, logistics, engineering, communications, nursing, weather, intelligence, space and missiles, and more. Advanced schooling is provided to prepare you initially for your career field. In addition, the Air Force provides opportunity and resources for its officers to pursue professional continuing education and advanced degrees. Army ROTC students may be selected for a variety of specialized training opportunities, such as Airborne School, Air Assault School, pentagon internships, and summer leadership internships. Army officers may serve in one of 16 career branches, which are divided into three categories: maneuver, fires and effects; operational support; and force sustainment. Selected officers, after entrance on active duty, are sent to civilian universities or service technical institutes for graduate work leading to a master’s degree or to a doctoral degree in specialized fields. The Aerospace Studies program is designed to develop the character and skills required of professional Air Force officers. The goal is to provide you with the foundation to become an officer in the United States Air Force, while acquiring a baccalaureate degree in a field of your own choosing. The curriculum during the first two years (the general program, one credit per semester) is an introduction to the Air Force and its heritage. It focuses on career opportunities, doctrine, mission, and organization of the United State Air Force. It also includes studies in the development of air power, and present and future concepts within the Air Force. These courses are open enrollment, do not require any obligation for military service, and do not require wearing a uniform. Concurrently with these academic subjects, cadets participate in “leadership lab” (for an additional one credit hour per semester). Leadership lab centers around military customs and organization and includes hands-on learning that enables you to gain insight into the dynamics of military leadership. There is no service commitment during the first two years (for non-scholarship cadets), and it is an excellent way for you to explore the lifestyle and career options the Air Force has to offer. You must take both the general course and leadership lab to be enrolled in the AFROTC program. Optional noncredit summer professional development programs afrotc.com/college-life/summer-programs/ at Air Force bases provide further exposure to the Air Force and are funded by the Air Force. Qualified cadets have the additional option of becoming flight officer candidates. Selection for pilot or other rated training will be made during your junior year. If you are selected, you will enter USAF pilot or rated training following graduation and commissioning. Cadets commission and begin their careers as Air Force officers, upon completing their undergraduate degree and AFROTC program requirements. After commissioning, you are assigned to an Air Force position that best combines your academic major and desires with the needs of the Air Force. Past graduates have been assigned to areas of air operations (both flyers and nonflyers), administration, physical and social sciences, engineering, and research and development in aerospace technologies, to name a few. In addition, qualified cadets can pursue military careers in the medical and legal career fields after completing the AFROTC program. The Military Science program is designed to develop the leadership and management skills required of an officer in the United States Army. The military science curriculum complements your normal coursework for a baccalaureate degree and provides a basis for progression toward a commission as an officer in the United States Army. Although the complete program encompasses four years, you can join the program at any point in your time at Ohio University, as long as you have two years remaining. This two-year period can be undergraduate or graduate work. The first two years of Army ROTC is known as the Basic Course (BC). During the BC, you take classes in general military subjects, including an introduction to the Army ROTC program, basic skills, leadership, team building, and small-unit operations. These courses provide a basic understanding of the Army and a background for the second two years of the program. The basic courses are open enrollment, do not require wearing a uniform, and have no military obligation unless on an ROTC scholarship. Entrance into the second two years of the Army ROTC (the Advanced Course) is selective and competitive. You can qualify for the Advanced Course by completing the BC, by current service in the National Guard or Reserves, or by attending a four-week ROTC Leaders Training Course. The Advanced Course will expand your knowledge of military subjects, including military justice, tactics, ethics and professionalism, management, training, and current issues affecting the military. In addition to the classroom work, the department conducts a leadership laboratory, in which all students take part in planning and conducting such adventure-type outdoor training activities as rappelling, survival swimming, marksmanship, physical training, and land navigation. Advanced Course students are required to attend a four-week summer Leadership Development Assessment Course between their junior and senior years. All summer camp expenses, including meals, housing, travel, and uniforms, are paid by the Army. In addition, each cadet is paid approximately $700 in military pay for camp attendance. The Department of Military Science also sponsors several extracurricular clubs or activity groups, organized by the cadets with faculty advisors, such as the Color Guard, “Red Leg” Cannon Crew, and Ranger Challenge. Cadets might be selected on a voluntary basis for attendance at U.S. Army schools, such as Airborne (parachutist) School, Air Assault School, Mountain Warfare, and Northern Warfare School. Army ROTC offers full two, three and four year scholarships to qualified students. These scholarships pay full tuition and student fees. Scholarship cadets also receive an annual book stipend of $1200 as well as monthly stipend of up to $500. In addition, cadets may also receive an Ohio University sponsored room grant that covers the cost of a standard double dorm room. Students who do not qualify for a ROTC scholarship may be eligible for a scholarship through the Army National Guard or Army Reserves, as well as the OHIO sponsored room grant. Another of University College’s efforts to enhance and reward undergraduate teaching and learning is the University Professor Award program. To acknowledge outstanding undergraduate teaching, Ohio University students nominate and select University Professors on the Athens campus each year. University Professors are tenure-track faculty members who have demonstrated teaching excellence. The University Professor Selection Committee consists of representatives from the undergraduate student body. Upon selection by the student University Professor Selection Committee and final appointment by the provost, each professor is granted a release from part of his/her normal teaching duties and receives $2,000 for professional development. The University Professor uses this opportunity to develop and teach one original class.